Beauty In the Beast at The Waiting Room, Oct. 7, 2010. First up was A Lull, a Chicago five-piece with two primary drummers but where everyone had some piece of percussion equipment to bang on. As you’d expect, the music was all very rthymic, almost tribal, with a guitarist adding distinctively Fripp-ian touches (no chords) while another guitarist sang in a dry, tonal sort of way. When it wasn’t droning it did remind me of latter-day King Crimson, and when all five members were pounding out rhythms, it became a celebration. Our old friends Cowboy Indian Bear were next, doing their usual thing with the usual panache. It was suggested that the Lawrence band might be over-playing Omaha since they seem to perform almost weekly. Overexposure is never a good thing, but then again, people can’t seem to get enough of CIB. Then came the debut of Beauty in the Beast — a three-piece featuring Eli Mardock and Carrie Butler, both formerly with Eagle*Seagull, and drummer Andrew Tyler. Mardock played acoustic and electric guitar and bass, switching between the three from song to song, while Butler played synths, and both handled vocals, though Mardock is still clearly the group’s “frontman.” The seven-song set started with an acoustic-powered ballad reminiscent of The Church, while the second song sounded very E*S; then Mardock switched to electric and things began to take off. Unlike their recordings on their Facebook page, Mardock still has his warble-y, Bowie-esque affectation on stage though it’s much less pronounced on music that is more laid-back, more swinging (in a midnight sort of way) than E*S. I guess the word I’m looking for is “groovy.” Butler took over the lead vocals on the third song, and while her voice is pretty, it’s still not quite strong enough for the stage — that’ll improve over time. She was at her best when she shared vocals with Mardock in tight harmony. On the whole, Beauty’s arrangements are simpler and more straight-forward than E*S’ over-the-top dance explosions, with Tyler stripping the percussion to its bare essentials. They closed with an upbeat New Wave number featuring Butler’s Gary Numan synths, while the seventh and last song featured Butler (on bass) and Mardock (on electric guitar) playing over a ghostly looped synth march that made for a dramatic Ennio Morricone moment. 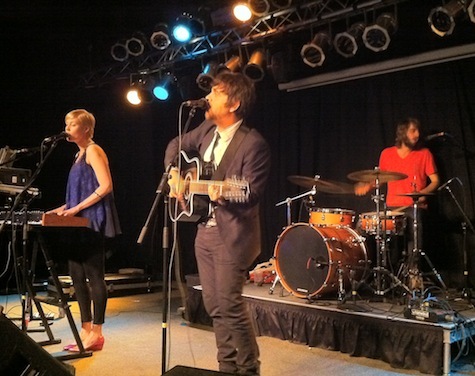 Tonight at The Waiting Room it’s Syracuse indie pop band Ra Ra Riot (Barsuk). File their music under the same college category as Tokyo Police Club, Vampire Weekend, SSLYBS, the usual suspects. Joining them are Chikita Violenta and We Barbarians. $15, 9 p.m.
Tonight also is the first of a two-night reunion of local heroes The Sons of… Tonight it’s the Sons of The 49’r at, well, The 49’r of course. Joining them are our old friends The Filter Kings. It’s probably $5, and probably starts at 9 p.m. Then tomorrow night, the band magically transforms into The Sons of O’Leaver’s (featuring Mike Jaworski of Cops, Hong Gyn Corp., Hello from Waveland), with special guests Little Brazil. This one will be packed. $5, 9:30 p.m.
Back to tonight’s action… Bear Country and Thunder Power are playing at Stir Lounge in C.B. $5, 9 p.m.
Also tonight, there’s a last-minute show (replacing the canceled Justin Townes Earle show) at Slowdown Jr. featuring Strand Of Oaks, McCarthy Trenching, and Fortnight. 9 p.m. and absolutely free. Tomorrow night (Saturday) in addition to that gigantic O’Leaver’s show, Rock Paper Dynamite is headlining a gig at The Waiting Room with High Art and SFS. $7, 9 p.m.
Down at Slowdown Jr. Saturday Yep Roc band Jukebox the Ghost is headlining a show with Hooray for Earth and AB & The Sea. $10, 9 p.m. Finally, Sunday night, seminal ’90s alt-metal band Helmet comes to The Waiting Room with Intronaut & Goes Cube. $15, 9 p.m.
You’re back? Good. I should point out that I have some familiarity with Miller and Guster. I interviewed him way back in December 1999 in the band’s tour bus before a concert at the long, lost Ranch Bowl. Miller was a whirling dervish, jumping around the bus looking for a lost Wheat CD (you remember Wheat, right?) having just done an in-station performance at KCTY The City, an Omaha FM radio station that, in its day, was sort of ground breaking in that it had no real format, no play list. The DJ’s played whatever they wanted to, and Miller couldn’t believe it. That video, a stop-action piece that shows the band performing dressed in long underwear while white-hooded (Klannish?) drones decorate the stage (and the band) with paint, was picked as iTunes “video of the week,” an honor that drummer Brian Rosenworcel called in a Gloucester Times article “The biggest news that ever happened in our band’s history.” Wow. Miller said the video and its exposure is something they wouldn’t have had without the label backing. Still, he’s well aware that there are a lot of bands that are “breaking through” on indie labels. Which made me scratch my head and wonder how any band does it. Last week’s sold out Local Natives show at The Waiting Room is a prime example. Hundreds of fans were grouped around the stage singing along to songs that have never been heard on Omaha airwaves outside of small, 2-hour boutique radio shows like 89.7 The River’s stylish New Day Rising show (Sunday’s at 9). If that’s the only outlet, is radio important any more? It can now be said that Eagle Seagull is no more, just as their best album, The Year of the How-To Book, has finally been released (You can find it on iTunes; I have no idea if it was physically released in the U.S.). Its availability marks the end of years of speculation if it would ever see the light of day. We all heard the Starbucks story (though I’ve never seen it documented) and assumed that after that debacle someone would pick it up. If the waiting seemed like forever for Eagle Seagull fans (the album was recorded in May 2007), it must have been an eternity for the band. When it was announced this spring that [PIAS] was releasing it outside of the U.S., the long nightmare appeared to be over. But it wasn’t. And now, eight months after that, the record is out but the band is no more. And maybe it’s for the best. Because I just spent the last seven minutes listening to “Theologians Tell Me,” one of the demos available from Beauty in the Beast’s Facebook page, and am now listening to it again. Drenched in delay, frontman Eli Mardock sounds like early Anton Newcombe (Brian Jonestown Massacre) belting out a sinister baroque ballad in 3/4 time, complete with a two-minute instrumental interlude. Carrie Butler does a sly, graceful vocal on synth-fueled popper “If You’re With Me, You’re Against Me.” And while “King of the Crickets” is soft and dreamy (or spacey), there are touches in the effects-laden harmonies that will remind you of Eagle Seagull — but those few moments will be the only ones that do. Rounded out by veteran Lincoln drummer Andrew Tyler (Indigenous), you can catch the trio tonight at The Waiting Room and decide for yourself if Eagle Seagull’s passing is an occasion to mourn or celebrate. I’m leaning toward the latter. A final little post script on all this: Eagle Seagull will go down as one of the most controversial bands in Nebraska history. They were hated as much as they were loved. For a number of years they were the biggest band from Lincoln and everyone thought they were poised to break through. But it never happened. My only regret is that I never got a chance to see them perform “Twenty Thousand Light Years” on Letterman. That would have been a gas. Playing with Beauty in the Beast is Lawrence band Cowboy Indian Bear, who has become a local favorite thanks to their almost monthly treks to Omaha. Also on the bill, Chicago avant-pop band A Lull, whose rhythm-heavy style comes by way of no less than three percussionists. The Village Voice compared them to Blitzen Trapper, Fleet Foxes and Grizzly Bear — talk about your ultra-hip trifectas. $7, 9 p.m.